DS Grace Allendale has returned to her home town of Stoke-on-Trent, having moved away some years ago to Manchester with her mother. Recently widowed, she is focusing on her career and the promotion she’s earned, heading up a team of three Detective Constables. 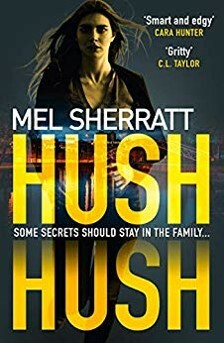 What her team don’t know is that Grace endured an unhappy childhood, and since she’s now moved back to Staffordshire, she is forced to confront her past. Her Father was a violent and abusive man. He was murdered a year ago, and so far, the perpetrators(s) have yet to be captured. On her first night-out with her team, she observes one of the local problem families; namely the Steeles. What her team don’t know is that Grace’s murdered father was the patriarch, George Steele, so she realises that she has step-siblings. Grace is related to this problem family, by blood. When one of the Steele lieutenants is killed in a similar fashion to George, the spotlight is turned back on the family. The two oldest brothers Eddie and Leon Steele run a gym, but beneath the façade, it’s a front for stolen goods, drugs, money-lending and ‘parties’. There are two further killings, from which the trail leads back to the Steele family. Back at base, her loyalty is questioned by her team as there appears to be a ‘mole’ within the police station - passing information back to the Steeles’. It now appears that Grace is fighting on two fronts. What Mel Sherratt has provided is a cleverly constructed story, with a strong female lead. Grace Allendale is damaged, but ultimately a resolute character. She puts the law first and her blood-links firmly second. The author tackles some issues that others may shy away from, but she does it thoughtfully and with compassion. The Stoke-on -Trent area that she knows so well is brought to life vividly, and used as an evocative backdrop to the events that unfold. This new crime series has started very well and I’ve no doubt that Grace will be making further appearances.